Apologies a bit late, but found this today. Managed to knock off £10 off a fragrance I was after. We hope you enjoyed the scorching Bank Holiday weekend , it’s not over yet! We’re keen to keep the sun-times going, so we’ve got a juicy discount just for you. Take advantage of 15% off everything* by simply shopping before 7pm on Thursday evening. Use code SUN15 at our online checkout, or show this email in-store to secure a brand new scent for yourself or as a thoughtful gift. Enjoy the weather, enjoy the discount and happy shopping! 15% off is available online & in-store between 7pm Tuesday 8th May 2018 until 7pm Thursday 10th May 2018. 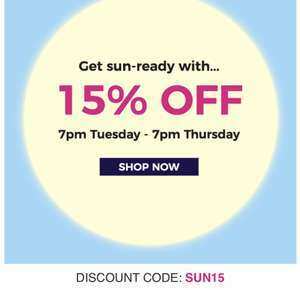 Simply enter the code SUN15 at the online checkout, or show this email in-store to get 15% off your purchase. Please note, all Creed and Escentric Molecules products, Gift Cards and scentaddict and Discovery Club subscriptions are excluded from this offer. Discounts cannot be used in conjunction with any other voucher code or promotion. One transaction per customer, maximum 5 units per purchase, whilst stocks last. The Fragrance Shop reserves the right to amend or cancel the offer at any time. Oops, thank you for that! PERFUME15 15% off when SUN15 expires.